CROSSOVER! Everybody loves a crossover! Several different blogs have combined forces to look at one of DC’s more interesting one-shot efforts, Secret Files and Origins! If you’re unfamiliar with Secret Files and Origins, these were a series of one-shot comic books and mini-series produced by DC Comics between 1997 and 2010. These books were the illegitimate love-children of DC’s Secret Origins (1986-1990) and Who’s Who (1985-1993), but with the added benefit of being about one particular group and/or time period. 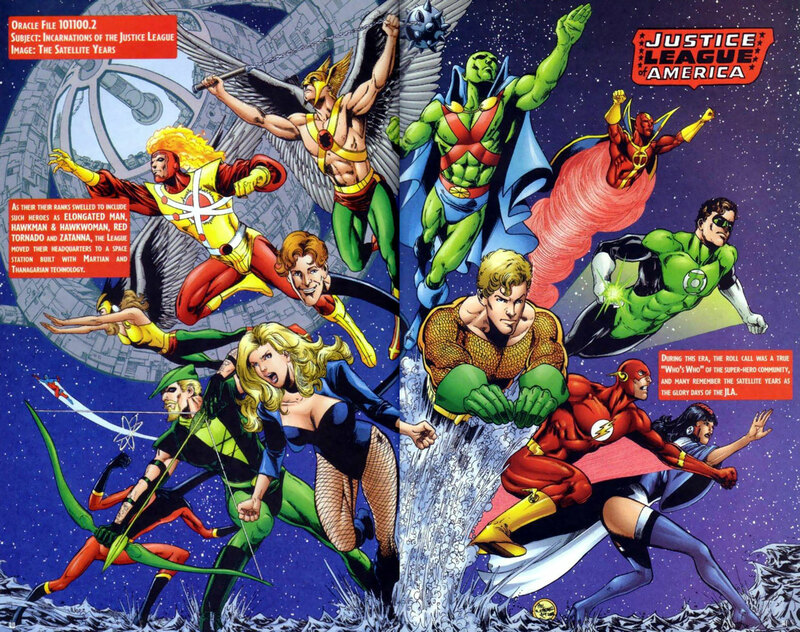 Today here at FIRESTORM FAN we’re going to look at JLA Secret Files #3 (December 2000). This particular issue was released to capitalize on the fantastic “Tower of Babel” storyline that had just concluded in JLA. This 64-page Secret Files contained a nice full-length story that tied into “Tower of Babel”, some short stories, several character studies, and a section entitled “Incarnations of the Justice League”. One of those “Incarnations” was the Satellite Years, as you can see below. Interestingly, several members that appeared in the drawing apparently didn’t merit being mentioned in the text, such as Firestorm (ouch! 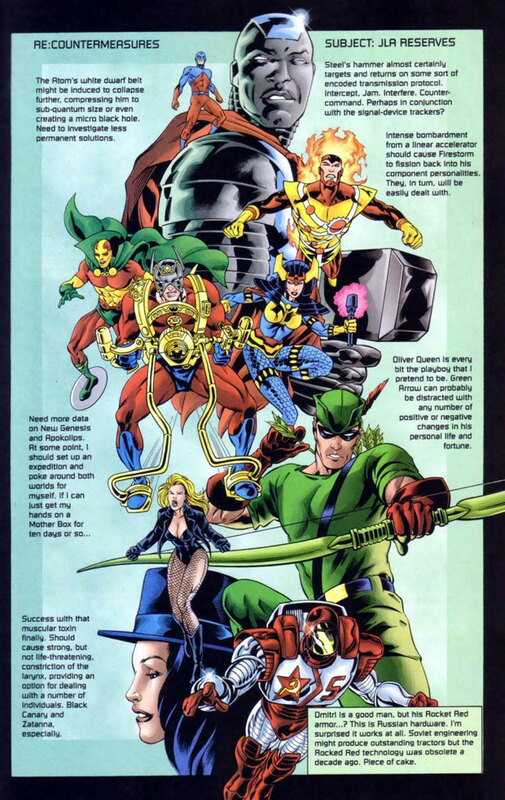 ), the Atom, and Green Arrow. Click the image for a larger version. Prior to this Secret Files, Firestorm had appeared in another, Guide to the DC Universe 2000 Secret Files & Origins #1 (March 2000). A few years later, Firestorm earned an entire page to himself in JLA/JSA Secret Files & Origins #1 (January 2003). As mentioned, several different blogs have combined forces to look at various Secret Files issues. While I’m featuring Firestorm here on my site, you should visit these other character-specific blogs to see how they spotlight their own favorite heroes in Secret Files. Visit them now, visit them later, and visit them often! My thanks to Diabolu Frank and Anj for organizing today’s crossover event! If you’ve enjoyed this blog crossover, then you should check out some previous comic blog crossovers we’ve done. The first major blog crossover celebrated the gorgeous George Pérez/Alex Ross painting from the Crisis on Infinite Earths 1998 hardcover. The next major blog crossover was a celebration of the Super Powers Collection’s 25th Anniversary. Some subsequent major crossovers included: DC Challenge, Read This Too, Mayfairstivus, April Fool’s Day 2011, Blackest Night to Brightest Day, and Animated Anthem Day! Posted in: Crossover, Firestorm #01: Original (Ronnie/Martin), Firestorm #05: Ron solo, Justice League of America. Holy crap– it never even occurred to me that there might be a SF&O Wikipedia page. That would have made my life so much easier in drafting my own blog entries for today. I love that Satellite Era spread, but hating center folds, I only used half of it as either one of the last scans I did for my Martian Manhunter fan site and/or one of the earliest images to appear on the blog incarnation. This is actually a pretty rare sighting of J’Onn J’Onzz with this line-up, since he was only ever a part of it thanks to retroactive continuity. I sometimes wonder if this pin-up fueled the fire in Brad Meltzer’s belly to remove any trace of the Martian Manhunter from this period in Identity Crisis and the subsequent Justice League of America relaunch. As a ’70s kid, he’d only have remembered J’Onn as a guest-star every few years, usually only hanging out with a few of the older members. I know you got excited about the prospect of a Firestorm/Atom team, but I’d murder a random derelict to have seen Steel/Atom instead. D. Curtis Johnson offered some nice take-downs that I’d have liked to have seen attempted. “Doom” did not improve on “Tower of Babel” in that respect, and it seems like Johnson could have topped both if given the chance. I like that Pablo Raimondi art, as well. Frank – “… murder a random derelict ..” Yeah, that’s never going to come back and haunt you in court.